I love that Heath played chess in the park. I love the outtake in '10 things' when he kisses Julia Stiles when the scene didn't demand it. He made her and everyone else laugh out loud. I also love that we talk about loving him in the present tense. I love Heath for his puzzlement, his obviously bewildered, but nontheless amused and charming reaction when he was asked in an interview whether he owns a sweatsuit. Yeah I know what you mean Sandy. Talking about in the past tense doesn,t seem right somehow. I know that probably doesn,t make any sense, but then none of this does. I love that Heath quit smoking when Michelle was pregnant with Matilda....even if he did start up again, at least he tried! I saw that interview and I thought his reaction was adorable too. 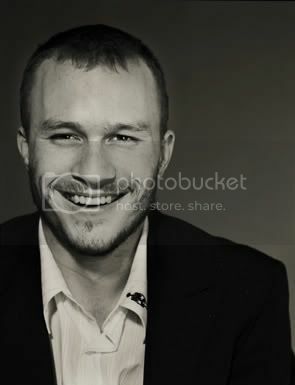 It was so Heath, I wanted to hug him. I could have kicked that interviewer, though, he wasted the precious time he had with Heath by asking stupid questions, when he could have asked him some really good questions. well, it is true. we still do love him.